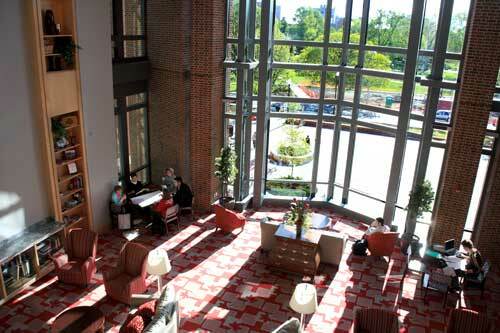 In 2010 a new Ohio Union opened its doors. Gone are the bowling lanes, but in their place is a multi-functional building that is perhaps the best in the country. The new Ohio Union is 318,000 square feet and is home to nearly 1000 student organizations. The massive structure doesn't feel massive when inside. In fact, it has been designed so that the scale of the building is more like small series of houses built on a main street. The Great Hall is the most immediate and striking feature of the new union. This is the heart of the building and from here access to the 4-levels is easily accomplished via stairways or elevators. Some sections of the building are open 24 hours a day and require student access passes. Other areas are open to the public during regular hours. Perhaps the most noticeable characteristic of the Ohio Union, is how, well, is how Ohio State it is. From floor to ceiling a conscious effort was made to incorporate scarlet and gray, buckeye nation, and Ohio. With all the buckeye references, you might think a non-buckeye visitor would be put off, but that's not true. It might be too much from visitors from the state up north, but then, anything Ohio might not set well with them. The overall feeling of the new union is much like home. They have taken considerable effort to create intimate spaces out of the great expanse of square footage so students, some spending time away from home for the first time in their lives, feel comfortable and right at home. The Grand Ballroom can be summed up in one word: BIG! 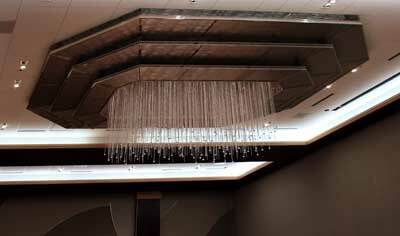 It is one of central Ohio's largest event spaces at around 18,000 square feet when fully opened. It can also be divided into 3 smaller units with massive deployable walls. The main featurse of the room are the giant block O light fixtures that can be configured in a infinite variety of lighting schemes thanks to its energy saving LEDs. With all the discussion about the appearance and structure of the Ohio Union, we shouldn't forget the union's purpose: creating an atmosphere where students can pursue extra-curricular activities. Those activities could be just a relaxing place to read, meet up with friends, have a meal, or get involved in student activities. 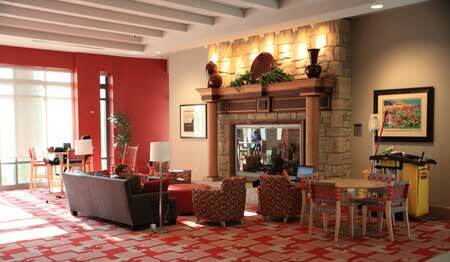 The Center for Student Leadership and Service is housed in the Ohio Union. This includes almost 1000 student organizations. Staff is available for students to help find volunteer opportunities or provide guidance for other activities that best suit the student. 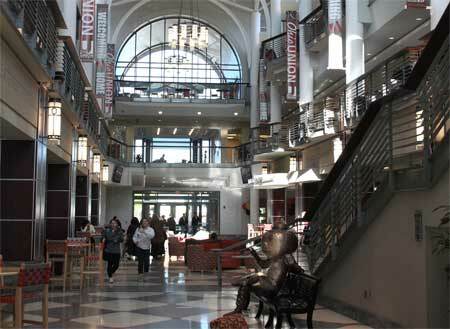 Most of the Ohio Union is open to the public except for certain areas that require a student ID to access. Docents are available for guided tours of the building, but advance reservations are required. Brutus Buckeye statue in the form of a butter sculpture in the manner of the Ohio State Fair Butter Cow sculpture. This statue is located in the lower level cooking education facility.